Thousands of Mozambicans, many of them children, received an oral cholera vaccine on Monday. The vaccinations were part of a six-day emergency campaign to stop the spread of the disease following Cyclone Idai last month, the World Health Organization (WHO) announced. “Confirmed cases of the acute diarrheal disease quickly shot from five when it was declared on March 27 into the hundreds and currently is above 3,100, with six deaths,” the Associated Press reported on Sunday. Almost 900,000 doses of oral cholera vaccine arrived in Beira, the hardest-hit area, on April 2. More than 1,200 volunteers are assisting the Ministry of Health and its partners for this anti-cholera campaign. Each vaccination team is led by a health worker and three other aides who prepare the vaccine vials, keep track of the vaccines given and mark the fingernails of those who have been vaccinated. 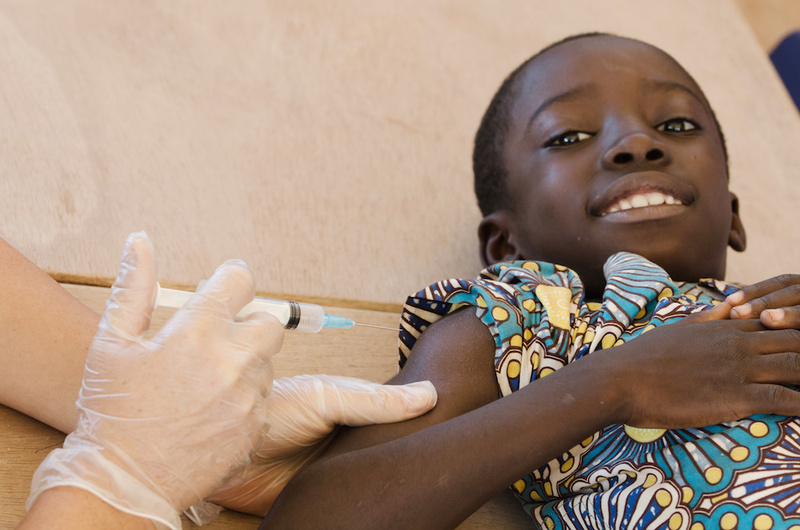 The vaccines are being given to populations identified by the Mozambique government as the highest risk – those without access to safe water and sanitation. Besides Beira, the anti-cholera vaccine campaign includes the nearby villages of Dondo, Nhamatanda and Buzi. “Controlling cholera in these areas will reduce the risk to the rest of the population because fewer people will be taking it back and forth into the wider community,” WHO cholera vaccination expert Kate Alberti explained. A single dose provides protection for about six months. The Mozambique Ministry of Health declared a cholera outbreak on March 27, following the widespread destruction from Cyclone Idai on March 14. Since then, hundreds of thousands of people have been living in temporary settlements without access to safe water and sanitation. On a visit to Beira this weekend, Minister of Health Dr. Nazira Abdula met with WHO officials and their partners. She acknowledged their important support for the oral vaccination campaign. “It’s very difficult to roll out a campaign of this scope in only three days,” Dr. Abdula explained. David Hubler David E. Hubler brings a variety of government, journalism and teaching experience to his position as a Quality Assurance Editor at APUS. David’s professional background includes serving as a senior editor at CIA and the Voice of America. He has also been a managing editor for several business-to-business and business-to-government publishing companies. David has taught high school English in Connecticut and at Northern Virginia Community College. He has a master’s degree for Teachers of English from the University of New Hampshire and a B.A. in English from New York University. In March 2017, Rowman & Littlefield published the paperback edition of David’s latest book, "The Nats and the Grays, How Baseball in the Nation's Capital Survived WWII and Changed the Game Forever."